This should be a no-brainer, but it’s a good thing to remember: getting out in the sun provides your body with valuable, natural vitamin D. Vitamin D can help with everything from boosting your immune system to strengthening your bones, and sunshine is a great way to take in Vitamin D naturally. When you go parasailing, you’ll be secured in the harness and gently glide up as the boat gets moving. That feeling of flying, even with a gentle takeoff, can really get the adrenaline pumping — yes, even for those of you who aren’t afraid of heights. The excitement and new sensations are enough to trigger an adrenaline response in your body. Adrenaline may be a stress response, physiologically speaking, but it can help you breathe easier and may even help boost your immune system. Plus, that extra dose of adrenaline will get your heart pumping a bit faster and can help burn a few calories. We know, putting relaxation after talking about adrenaline might seem odd, but bear with us. Once your body moves past that initial surprise and adrenaline burst, parasailing is a surprisingly calming feeling. The parasailing boat goes fast enough to keep you aloft, but not so fast that you feel like you’re flying at lightspeed. That leaves you feeling like you’re floating on air. It’s not quite like floating in a calm pool or lying in a hammock, but it’s just as relaxing. Your body will respond accordingly and relieve some stress as you take in the view. Parasailing is a great way to enjoy the benefits of sun and fresh air without putting a lot of stress on your joints. 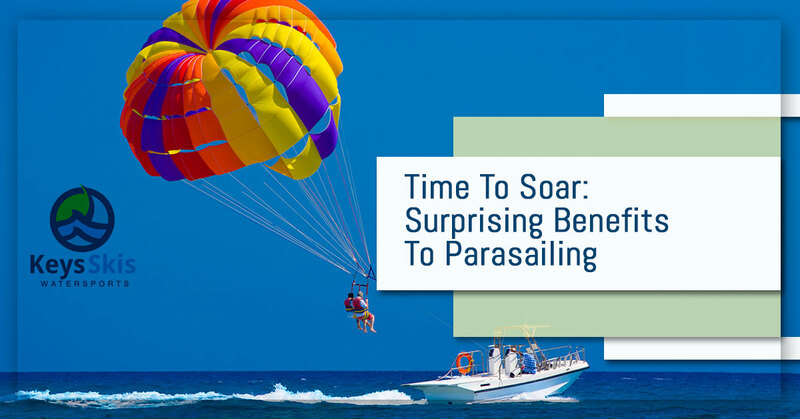 Now, that’s not to say that you’ll gain bodybuilder-worthy muscles while parasailing, but if you have weak joints, parasailing is a great alternative to exploring the Keys without hurting ankles, knees, or hips. Of course, if you have specific health concerns, be sure to discuss them with your parasailing tour company before booking. They’ll be able to help you determine whether parasailing is an appropriate activity. How often do you put all technology to the side and connect with those around you? For most of us, the answer is ‘never’ or ‘not often.’ Parasailing is a great excuse to put your phone down and just stop to enjoy the views and the people you’re with. You’d be surprised at the awesome benefits that has for your mental health. Book your Key Largo parasailing tour today. Schedule online or contact the Keys Skis & Adventure team to experience the benefits of parasailing adventures for yourself!